This one is going to be another hodge podge of makes, I don't have photos for a single manufacturer with enough different types to do a single make post. So in no particular order we will begin. 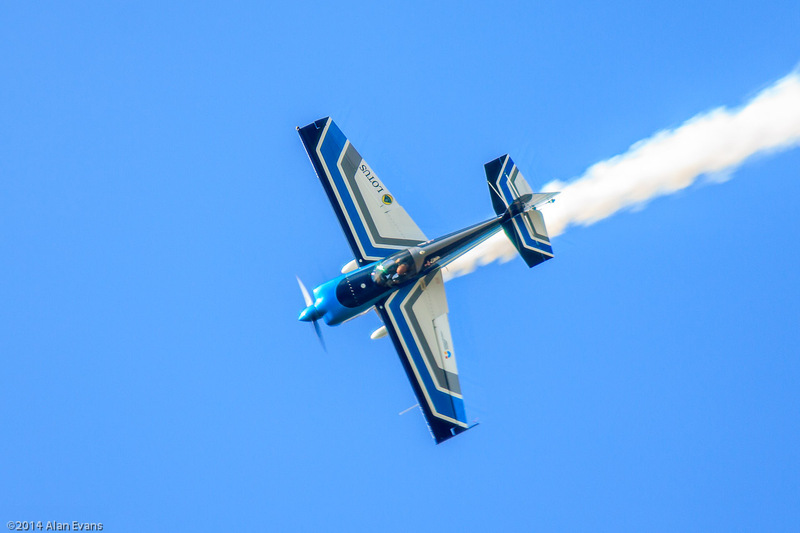 I'm starting with a modern aerobatic type, that is seen quite often in various high level competitions and at numerous displays around the world. The Edge 360, this one is part of the Wildcat display team and was taken at the 2014 Seething charity air day. The team is based at the nearby Old Buckenham airfield, which was another USAAF 8th AF Liberator base. I'm not certain by I think this aircraft was lost last year when the pilot tragically suffered a fatal heart attack while doing a press launch for the 2015 Old Buckenham airshow. Next up we have English Electric, who designed possibly the three best postwar aircraft to serve with the RAF, or not serve in the case of the last design, the TSR2. 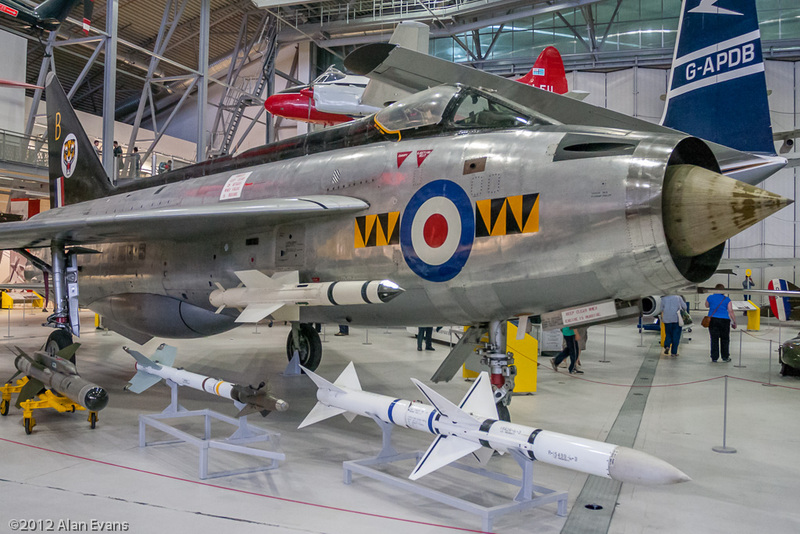 The EE Lightning, our first example, was the first aircraft that the RAF operated that was capable of exceeding the speed of sound in level flight, it was actually capable of Mach 2. The Lightning's biggest drawback was one shared by many great RAF fighters designed as interceptors, Such as the MK I Spitfire, lack of range. At least with the Lightning it was able to utilise air to air refueling to extend the range. The other great EE type served with the RAF, and also with the USAF as the licence built Martin B57, better known this side of the pond as the Canberra. 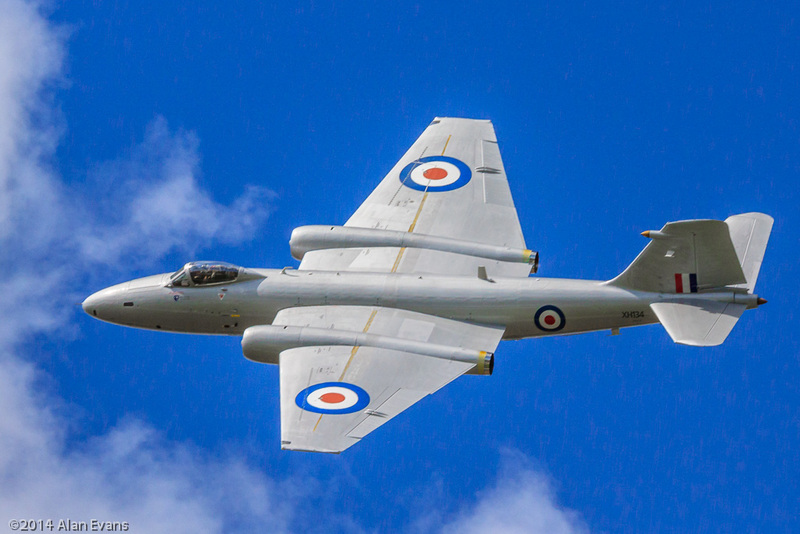 The Canberra still holds several long distance flight speed records. This is probably one of the faster variants of the type, the Photoreconnance PR9. Yes the pilot's fighter style cockpit canopy is mounted asymmetrically on the fuselage. The Canberra's crew sat side by side, but in the case of the PR9 the pilot sits up higher with a good all round view, while the navigator/crewman is seated lower down in the fuselage without any windows. Now I'm not too sure about the the next entry, as it is a consortium of different manufacturers. Whats worse is that some of them are also still seemingly using their own original names, and there is no consistency to this. 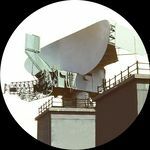 For example the design the consortium was put together to develop, is now in service with the British armed forces, well the RN and RAF at least, but in our military service it is known by the manufacturers original British name. Since that is one of the great names in British aviation, and it will be getting a post in due time the Merlin can wait. So for this post I will only show some of the other types that now operate under this banner. 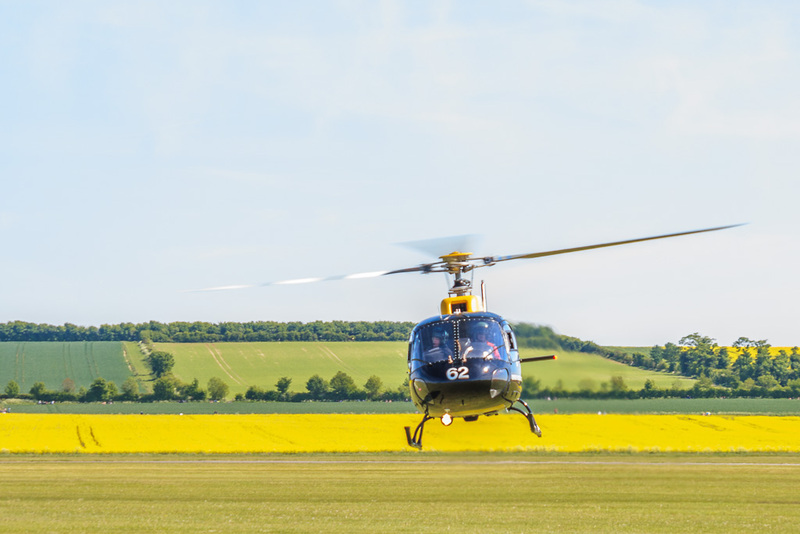 So first up we have the Eurocopter AS350 BB Squirrel HT1 of the Defence Helicopter School arriving at IWM Duxford bringing Red 10 to do the upcoming Red Arrows show commentary. 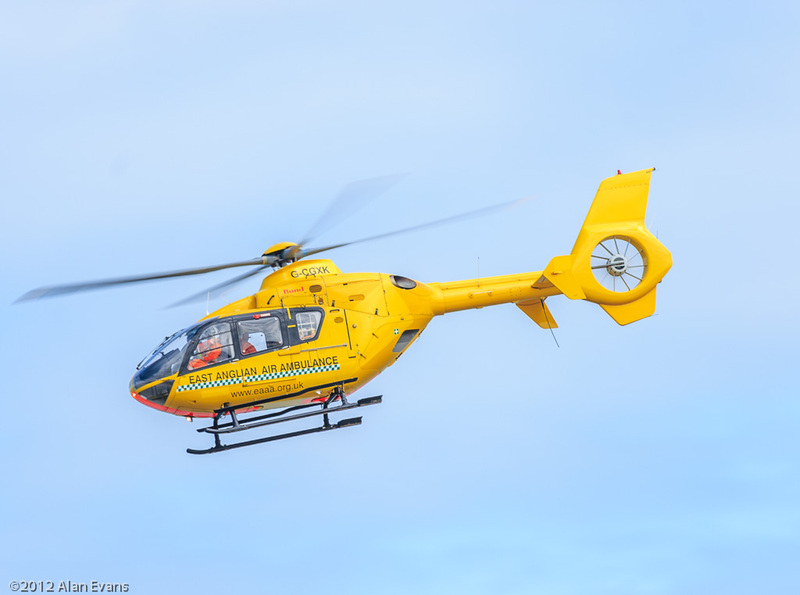 Next up is the East Anglian Air Ambulance, flying their Eurocopter EC135 T1. With the adoption of the EC135 the service became all weather, and so started operating 24hr a day (darkness is classed as a weather condition). The EEAA covers one of the widest geographic regions in the UK, during daylight hours it covers Norfolk (the second largest county in the UK by area) and Suffolk, neither of these two counties contain any Motorways, so road transport is not always easy, from it's base in Norwich. It also covers Cambridgeshire and Bedfordshire. After dark the area grows to cover Essex and Hertfordshire too. The service is funded by voluntary donations in a similar way to the RNLI lifeboat service. The EEAA now has a rather famous person as one of its pilots, as Prince William is now flying for them, having completed his service with the RAF where he was an SAR pilot on Sea Kings with 22 Sqn. So we now move from one European consortium to another. 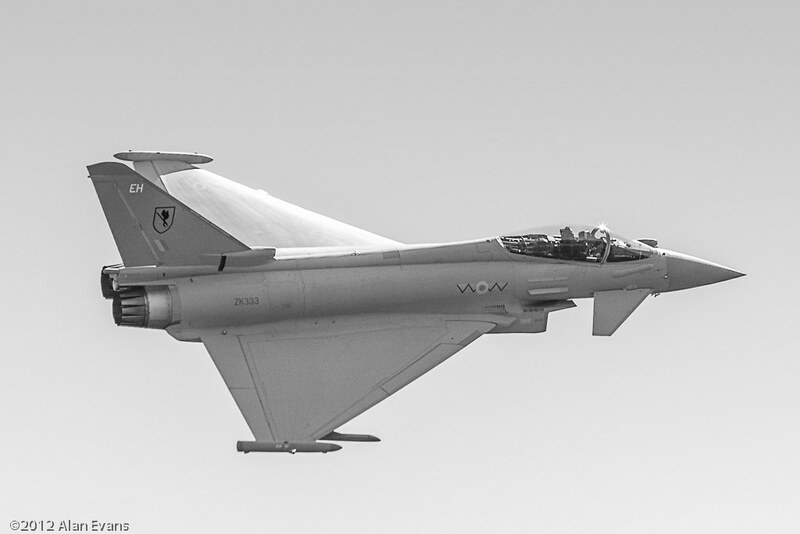 This one is not nearly so hard, as they have but one type to worry about, the Eurofighter Typhoon. The first shot is a 29 Sqn FGR4 from RAF Coningsby. 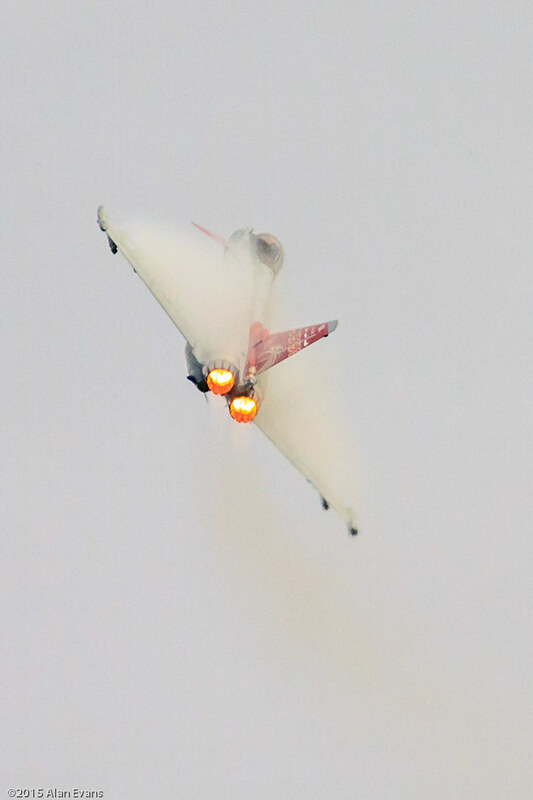 Showing the amount of water vapour it is able to extract from the air when doing high G maneuvers under full reheat. I really feel a better view of the Typhoon is deserved, so this is a 6 Sqn FGR4 from Leuchars in Scotland. 6 Sqn got the unofficial winged canopener badge when flying Hurri Bombers and the Hurricane version armed with the 40mm cannon against the Africa Korps in Libya and the Western Desert during WWII. 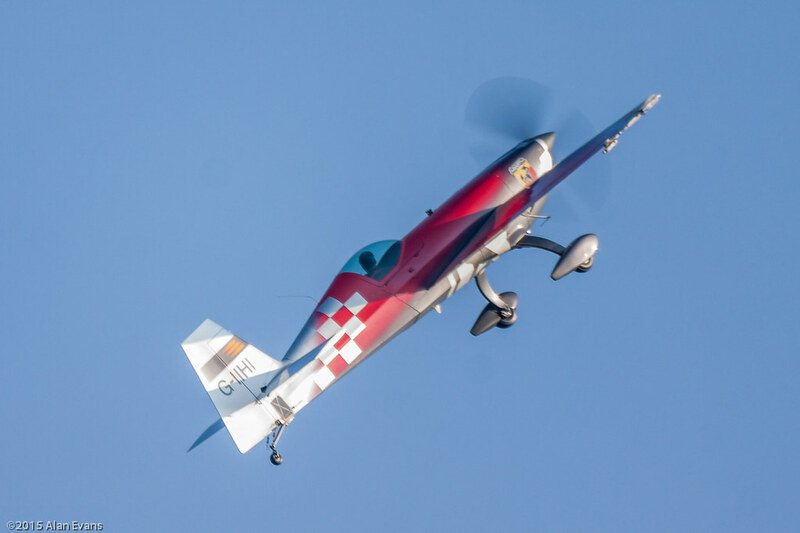 Finally we come back to a high performance competitive aerobatic aircraft for the final D entry. This time it is the Extra EA300SC.